When I was pregnant with our first baby, my sister-in-law set her wedding date and location for January 2008 in Perth, Australia. My first feeling was delight that I would actually be able to go; as a teacher extended leave in term-time wasn’t an option but maternity leave would sort that out. Fast forward a few months, and the reality of travelling halfway round the world with a five-month old approached with an accompanying feeling best described as blind panic. A month in Australia loomed large, as my teenage research based on Neighbours, Home and Away and Crocodile Dundee showed it was a place fraught with danger, unlike my sofa which had been my location of choice for the past five months. The practicalities of flying with a baby have been covered elsewhere on the Trunki Files – the only bit of advice I think bears repeating here is to take a sling. We flew with Emirates and they were great, except that they lost our buggy in both directions. We got it back (and a hefty lot of vouchers too after the return journey) but having the sling meant it really was no great stress. And once out there we went on boat trips and walks on the beach which were much easier with the sling. For us, fortunately, the flying was frankly a doddle. Charlotte slept and fed on her usual 3 hour rotation, we were seated at the front with extra legroom for my husband who is rather tall, and apart from having to taste the milk I had expressed at security it was all pretty straightforward. My in-laws had organised accommodation in a house close to my sister-in-law’s. It was great, but had fairly minimal air-conditioning and as this was January the temperature stayed above 30 degrees the whole time. The house also didn’t have a pool, which would have been a big problem had we not been close to Katy’s house, which did. So the house suited our needs very well, but we would have made different choices if we’d been visiting purely as tourists. I am extremely glad we brought our own dome style travel cot with mosquito net as we travelled round a good bit and so Charlotte slept well in the same bed each night, safe from marauding wildlife. 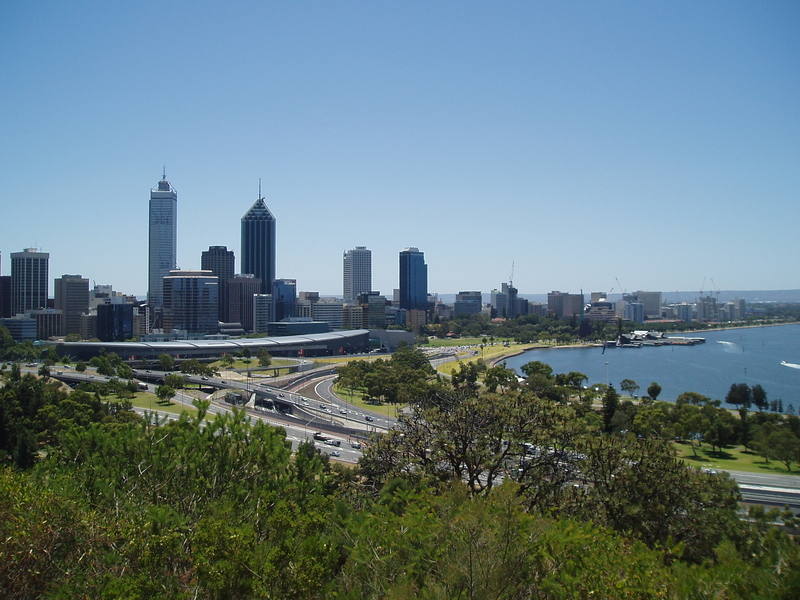 There is plenty to do in Perth itself, with good transport links to the city centre from the suburbs. Kings Park is beautiful and has plenty to see and enjoy, including beautiful views over the city. We spent a couple of enjoyable days exploring Fremantle which has an excellent museum, and the Little Creatures brewery which is ideal for kids as it is nice and noisy! There are beaches galore, and plenty of surfing opportunities – at which point the sunshade tent comes into its own for spectators like me and Charlotte. A trip north of Perth to Yanchep National Park to see the koalas was another fun day out, and we had our closest look at kangaroos at Pinaroo Memorial Park, which is a slightly strange combination of cemetery and wildlife sanctuary in a northern suburb. After the wedding (which was lovely, by the way, although I did have to completely remove my dress to feed Charlotte – note to self – breastfeeding dresses are a good investment) we spent a few days in the cool of Margaret River and the Great Southern region, around Denmark and Albany. There are lots of stopping points on the journey south, each with something special to offer; Mandurah, where we saw dolphins and some spectacular houses owned by the great, good and greedy; the Dolphin Discovery Centre at Bunbury; Busselton with its jetty and underwater observatory; and Dunsborough, with a beach which has become my ‘peaceful place’ in moments of meditation. We stayed in a cabin at Yallingup Beach Holiday Park, which was a very short walk to the stunning beach and had everything we needed. Margaret River itself was a lovely town to wander round, and a long lunch at Vasse Felix Winery which Charlotte thankfully slept through made for a real holiday feeling. The Great Southern region was a real highlight of our trip. It’s hard not to be impressed by landmarks like the Bicentennial Tree at Pemberton or the Lighthouse at Cape Leeuwin. We had both wanted to visit the Treetop Walk and the Valley of the Giants ever since reading about it in the Guardian travel section, but hadn’t expected it to be pushchair friendly!! So much so we went up twice! Another recommendation is the Eco-cruise at Walpole which was fascinating in terms of both the history and environment of this area. 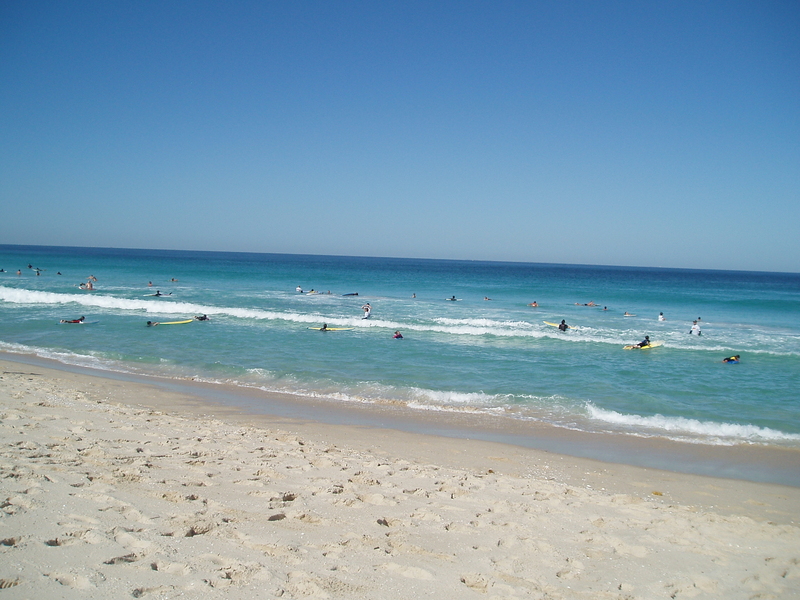 My husband had a brief and very chilly swim in Greens Pool near Albany (which is essentially the Southern Ocean) but beaches in this part of WA are more for scenery than surfing. 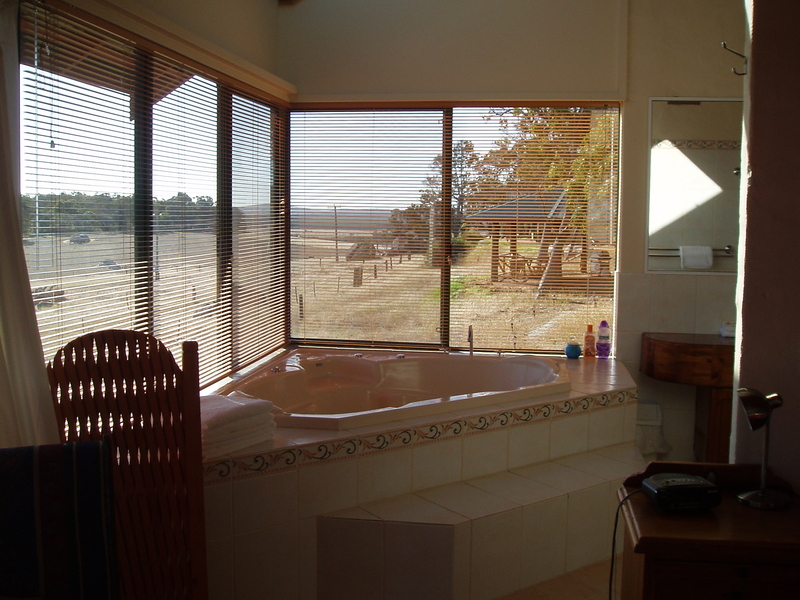 We enjoyed a bit of luxury by staying in one of the Ayr Sailean Chalets complete with spa bath – another new experience for Charlotte to chalk up on her Aussie adventure. Our final day in WA was spent dolphin watching on a boat from Rockingham. This was another great day out, but I mention it mostly because at lunchtime an older lady came up to me and said how she wished her daughter would go out and do things like this with her baby. We had quite a long chat, and I think that’s when it hit me that this trip had been a bit of a turning point for me. You cannot fork out a substantial amount of money on a trip to Australia and spend all the time sitting on someone else’s sofa gazing at your baby – although there was a bit of that to escape the heat and watch the Australian Open. 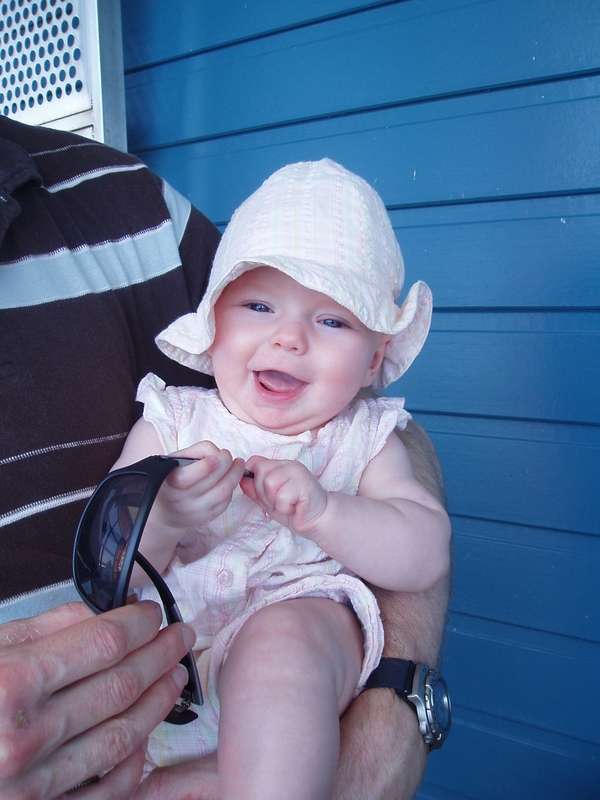 Babies are extremely portable, adaptable and rather like being with relaxed parents who are enjoying themselves. And (most) people are friendly and helpful and lovely when you travel with a little baby. 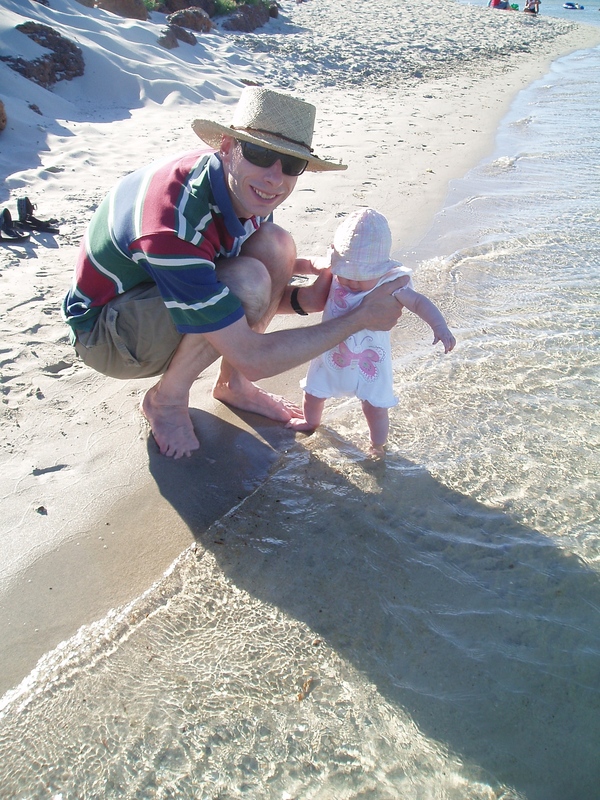 This entry was posted in Destination guides, Worldwide and tagged Australia with baby, family holidays Australia, family travel Australia, Perth holidays, Western Australia with baby. Bookmark the permalink.